Today we are going to be conducting an UltraFire 5000mAh 18650 Battery review. While it might be one of the most economical options for energizing a vape pen, the battery’s capacity is just not up to snuff compared to one of the best batteries. The price point for UltraFire is perhaps what entices vapers the most. The batteries can be found on eBay for under two dollars. However, when tested, the TR 18650 UltraFire has a fraction of its advertised battery life. Some UltraFire 18650 battery reviews have blamed the poor battery life on bad cells. But the majority of users suggest that these particular batteries are merely cheap and poorly manufactured. The one benefit of purchasing on eBay is that most of the sellers will offer free returns if you are not satisfied with your batteries. Therefore, you can be guaranteed your money back if the battery does not perform as advertised. The TR 18650 batteries received this rating because, as the majority of users claim, the cell life just doesn’t meet the officially designated capacity. In fact, the batteries only reach about 1000mAH on average. They also cannot reach high currents. In the course of conducting an UltraFire 5000mAH 18650 review, one of the central plus sides was that the batteries are extremely cheap and readily available. Some users also claim that their batteries functioned properly, and held their recharging capabilities. There are reports of users recharging their UltraFire 5000mAH 18650 batteries for several months and not seeing any compromised battery power. This kind of feedback occurs for about every one out of fifteen users. The upside here is that the batteries are so cheap you could very feasibly buy a set to try out and then return them if they don’t end up functioning properly. You’d have to do this on either eBay or Amazon, though. Otherwise you’d run the risk of not be guaranteed a full refund. There are so many available on both websites that you will have no trouble finding competitive pricing. It is also widely known that mAH on almost all batteries are going to be overstated. So, some users consider the fact that, for the price, the TR 18650 batteries only reaching 1000mAH is not such a bad thing. Furthermore, during all my tests with the batteries, they charged up properly without becoming overheated. Unfortunately for these batteries, the downsides still outweigh any of the benefits. Being that the official specifications are way higher than the actual performance of the batteries, most users feel that they were duped into buying a cheap and falsely advertised product, rightfully so. The batteries claim to be capable of recharging up to 1000 cycles, when they barely held their charge after just two. Most users share a similar experience. If you were going to be taking your vape on a trip for business or a long car ride, these batteries will most likely leave you high and dry. I read that one user made sure the batteries were fully charged, put one in and couldn’t even get his vape to turn on. The UltraFire TR 18650 5000mAH is also an unprotected battery, even though it is advertised as being protected on the cell itself. The small electronic protection circuit protects against common hazards like overcharging, short-circuiting, high temperatures, and over-discharging. In addition to being a much safer bet all around, the protected cells are also generally last much longer than unprotected, and hold their recharge life much better. Most users like to spring for the protected options as it provides them a little more peace of mind; I know I’m one of them. 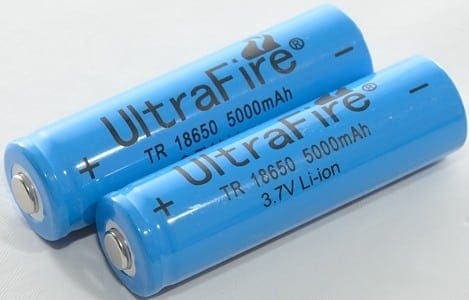 UltraFire battery reviews also seem to make a note that the batteries were constructed in China, and vapers are weary of Chinese mAH ratings being way off. Unless of course it is a more trusted brand. In almost all the tests that we performed for the UltraFire battery review, the levels were dramatically below the official specifications. The discharge begins to lose capacity around 2 amps. Discharge time slowly diminishes down to under an hour after a few charges. Maximum discharge power and energy output also beings to crash at around thirty minutes once the batteries have been taken off the charger. Not to mention the button on the top is missing those critically important vent holes to avoid eventual overheating. The shop also has a number of competitively priced recharging stations and quick-charge stations for reusable batteries. But the most innovative and useful tool on the UltraFire docket is their portable solar panel with its own USB output, priced at thirty-five dollars. As you can probably tell by the UltraFire review above, I am not the biggest fan of this product. I’m perfectly ok with spending a little extra to make sure that the quality of the battery I’m receiving will be dependable, safe, and, perhaps most importantly, not compromise my vape. However, there are plenty of options available to show those in doubt about the superior rechargeable battery for vape pens. The Sony VTC 4 18650 is popularly considered to be the most powerful and longest lasting rechargeable battery, and great for vape pens. There is also the LG HG2 3000mAh and Samsung 25R 2500mAh which are industry favorites and have accurate mAH ratings that you can depend on. Thanks for reading—good luck out there! thank you Sarah! no battery discussion is complete without mentioning ohms law and linking in an ohms law calculator. it is critical that individuals know what amperage battery they need for their application and use a trusted source that accurately tests for those rating vs temperature in an controlled environment. one of vapings best resources is battery mooch. an internet search will find his charts and sources to buy authentic batteries. typically for vaping batteries rated for under 15 amps are not recommended and can be extremely dangerous. any battery with fire in the name is not real world rated for vaping.